Photo of author at Raleigh-Durham International Airport protest on Sunday, January 29, 2017. Credit: Matthew Lenard. On Sunday, I joined more than a thousand demonstrators at Raleigh-Durham International Airport to oppose an unconstitutional executive order signed by President Donald Trump last week. The order attempts to block refugees from entering the United States for 120 days (or if they're Syrian, indefinitely) and to prohibit U.S. entry to nationals of seven Muslim-majority countries (Iran, Iraq, Libya, Somalia, Sudan, Syria and Yemen) for 90 days. Thankfully, the night before our demonstration and many similar demonstrations at airports around the country, a federal district court judge in New York ordered a temporary nationwide stay on portions of Trump's executive order, and at least four other judges have since followed suit. Nonetheless, certain Customs and Border Protection officers have been slow to comply with court orders, and these stays are neither complete nor permanent. Thus, many Americans remain outraged at the prospect of targeted discrimination as formal American foreign policy. 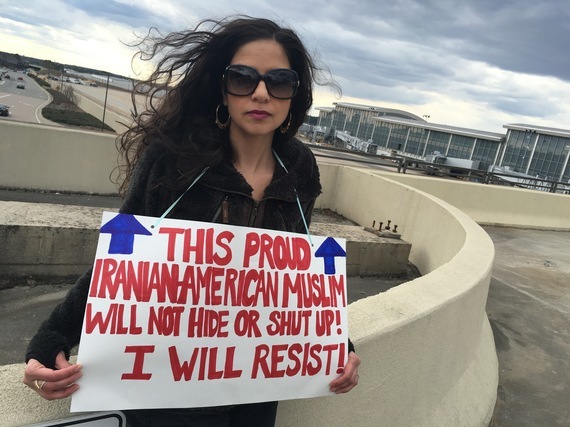 I am one such American, which is why I spent my Sunday afternoon standing outside of an airport terminal holding a sign that read: "THIS PROUD IRANIAN-AMERICAN MUSLIM WILL NOT HIDE OR SHUT UP! I WILL RESIST!" As a writer, I tend to avoid excessive capitalization and exclamation points, but this was a day for emphatic fonts and passionate punctuation. I was born in the United States, and I have lived in this country nearly my entire life. I want it to be safe from extremists of all stripes. But increasingly, I see our leaders, Republicans and Democrats alike in many cases, supporting religious fundamentalism--the evangelical, misogynistic American Christian variety at home and the sectarian, misogynistic Saudi Wahhabi variety abroad--without question. As a result, I worry for the future of this country I hold so dear. This isn't merely political for me. This is personal. And I'm not just talking about wrecked travel plans or the inability to see loved-ones. I'm talking about my soul and my psyche. When I first arrived at Sunday's protest, for about ten minutes before my husband and friends arrived to join me, I sat alone on a concrete barrier along the edge of the crowd and wept behind my sunglasses. A bus full of fellow protesters arrived, and the crowd began to cheer, visibly jubilant. But as heartened as I felt by their support and solidarity, I couldn't cheer. I was too disheartened by the cumulative effect of more than a year (and in some respects, more than a decade) of constant attacks on my identity to cheer for anything. All I could do was cry, and for a moment, I caught myself--a seasoned activist who had never wept this profusely at any protest before--feeling guilty for not joining in on all the chants the way I normally do. I regretted not being able to stage the loud resistance that the sign hanging around my neck-- with all its bright red capital letters and exclamation points--suggested I should. Patriarchal Western societies tend to disdain crying, particularly in public, as a hallmark of femininity and therefore an indication of weakness. But it's no secret that patriarchal Western societies have often been and continue to be oppressively and abysmally wrong about quite a lot, and when it comes to shedding tears, they get it all wrong. In truth, crying can serve as a healthy self-care strategy. It has been shown to improve mood and alleviate stress, and personally, it has helped make the last year far more tolerable for me. Crying is a kind of natural self-defense, and on today's field, defense may well be the best offense. My tears serve as both protest and protection. What others see as weakness, I know as strength. My emotions, my faith, my ancestry, my femininity--all these things that may make others think less of me--they lift me up. They allow me to bear the burdens of oppression without being broken by them.